Map of France's Muscadet wine region. Dept. de la Loire Infre. 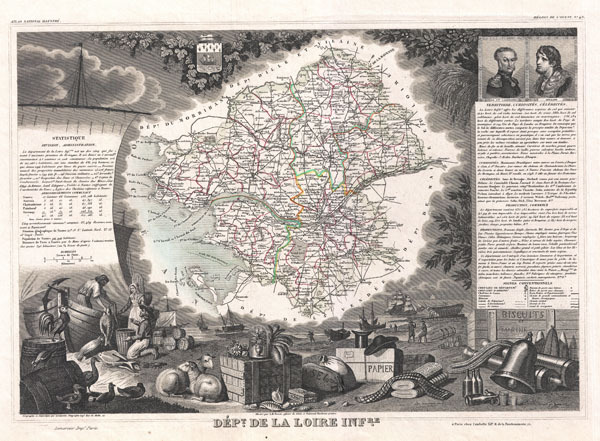 This is a fascinating 1852 map of the French department of Loire Inferieure, France (currently known as Loire-Atlantique.) This area of France is part of the Loire Valley wine region, and is especially known for its production of Muscadet, a white wine produced from the Melon de Bourgogne grape variety. This area is also famous for a variety of cow's milk cheese known as Fromage du Curé Nantais. The map proper is surrounded by elaborate decorative engravings designed to illustrate both the natural beauty and trade richness of the land. There is a short textual history of the regions depicted on both the left and right sides of the map. Published by V. Levasseur in the 1852 edition of his Atlas National de la France Illustree.